As we’ve seen, the marriage of Hermann and Elly joined the Ringel and Wohlgemuth families first in Weissensee and then in Charlottenburg. In one generation, Hermann had made the journey from the shtetl-like Scheunenviertel of his youth to the toniest districts of respectable Jewish society. In business, he had risen in status above his father’s role as a trader in the markets to become a registered merchant, a manufacturer and wholesaler of ready-made clothing. Differences in Hermann’s and Elly’s family backgrounds were reflected in their differing interests and even values. Hermann identified more as Jewish and attended the Orthodox synagogue on Pestalozzistraße, just a few blocks from the family’s spacious apartment at Schlutterstraße 12. When Elly went to synagogue, which was rarely, she went to a liberal congregation. Hermann took a particular interest in Zionism and its ideal of a national homeland in Palestine. As much as he appreciated his status as a Jew in Germany, he believed in the vision of the Jewish people reclaiming their historic homeland. He himself might be too old and settled in his life to become a pioneer in Palestine, but he believed in the idea and supported Zionist organizations. Of course, Elly had little patience for talk of Palestine and Zionism. She was raised to appreciate the luxuries of life and had no interest at all in ever living in an underdeveloped country in the desert. 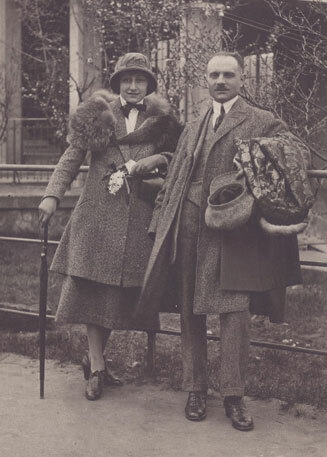 Both Hermann and Elly enjoyed vacationing in Germany’s mountain resorts and spas, but Elly went for the baths and nightlife while Hermann liked rugged hikes and physical culture. As a girl, Helga was attracted more to her father’s outlook than her mother’s which she found less meaningful. Her father prevailed on the question of schooling, and Helga was educated at the Theodor Herzl School, a liberal institution named for the founder of the Zionist movement. The first physical actions against the Jews came in February and March 1933 with SA raids in Scheunenviertel. Anti-Jewish signage was unfurled in the city’s market halls. The Nazi Party called for a boycott of jewish shops and department stores. On April 1, the boycott began with street demonstrations. Over the following months, crackdowns on Jewish professionals, civil servants and academics would culminate in public book burnings. These measures hit other Jewish sectors hard but early attempts to shut Jews out of the city’s commercial markets were more difficult to implement. Many families sought opportunities to emigrate and by the end of 1934 about 20,000 Berlin Jews had done so. The trick was to get out with any of your assets, which were subject to confiscatory taxes or forfeiture. Hilde’s husband Peiser was able to move his business to Holland and soon after they moved there themselves. On the Ringel side, Helga’s cousin Wolfie Shatner fulfilled Hermann’s dream and left for Palestine with a group of Zionist pioneers. Early in 1935, fresh street violence brought personal assaults on the Kurfürstendamm and mob actions targeted at ice cream shops. By summer, the Nazis cleaned up their act while hosting the Olympic Games in Berlin. The Olympic stadium was close to Charlottenburg, and Hermann was able to get tickets through his Jewish sports club for several events. Helga went and later remembered cheering for the African-American Jesse Owens. When the Games ended, the hammer came down on German Jews in the form of the Nuremberg Laws, issued in September, stripping Jews of most citizenship rights, prohibiting intermarriages, and banning commercial interaction between Jews and Germans. These laws would provide the legal foundations for all of the repressions to follow. 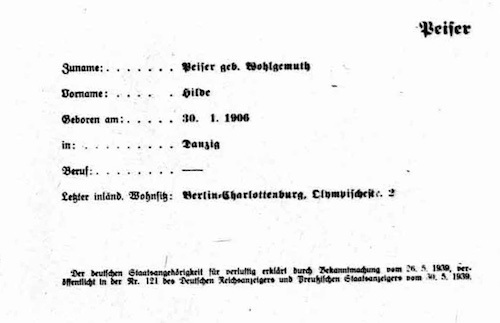 One consequence of the law was that it immediately stripped citizenship from German Jews who had left the country and were living elsewhere, which is why Hilde Peiser shows up in a database of people whose German nationality was annulled in 1935. Hermann’s sister Rosa Shatner, the widowed mother of Wolfie who went to Palestine, fled with her daughter Margot to her in-laws’ home in Belgrade in Serbia. His other sister Bette and her two daughters were able to get out to London. Of course, Hermann was also planning an escape for his family and business assets, but he was doing it deliberately. He had been squirreling money away in his export business, skirting the laws governing financial transfers. Hermann knew that his every move was watched by the Gestapo. Family and home life was disrupted when it was ruled that Jewish households could no longer employ German maids and servants, though some exemptions were granted to alleviate German unemployment. Among other measures a child might have noticed, Jews were banned at beaches, baths and sports facilities. Yellow notices barring Jews from certain park benches went up first in Prenzlauer Berg, then Wilmersdorf and eventually citywide. Crackdowns in the city markets effectively ousted Jewish dealers from dealing in eggs, poultry and game, as well as from the municipal stockyards. In the first targets of the coming Aryanization policy, Jewish food traders were forced into liquidation. Under this odious policy, Jewish business owners could be forced to sell their assets at far-below-market value to any Aryan buyer who bid for them. By the end of 1937, more than 30 percent of Jewish businesses and stores in Berlin had been expropriated or liquidated in this way. Hermann had to see the writing on the wall. In June, there would be a deadline to register all firms for Aryanization, and after that he would have fewer options. By the time that a new wave of street violence erupted in the spring of 1938, his exit strategy was in place and near to execution. Feigning normality, he took his wife on a early summer holiday at a spa in Czechoslovakia. Tragically, Hermann came down with an infection that turned to sepsis. He died June 24, 1938, just as the worst of Berlin’s summer violence was peaking. Up and down Berlin’s best streets, shops were marked with “Jude” in graffiti while Hermann was laid to rest at the Jewish Cemetery at Weißensee. During the next six weeks, Elly took over arrangements for their departure. I am not going to give here the full story of her 30-month flight with my mother out of Germany to their eventual arrival in New York. I have covered that in a previous chapter of family history (see “Implications for Righteousness in the Unknown Case of the Consuls of Toulouse” link). However, I will mention a few key episodes from their flight that relate to the citizenship theme of this chapter. Three generations of Wohlgemuths. From left, Betty, Helga and Elly. First we go to Betty Wohlgemuth, saying goodbye to her daughter and granddaughter, who are carrying only two small bags as if leaving on a weekend trip. Knowing they could be watched, they give each other just an ordinary hug and kiss goodbye, not the kind you give to someone you will never see again. Betty made her own choice to remain behind. She was sixty-three years old and had seen the terrible excesses of the Nazi regime. But she still regarded herself as a German as well as a Jew. She had lived her life in Kolberg, Elbing, Danzig and Berlin. She had seen the best of enlightened Jewish culture. 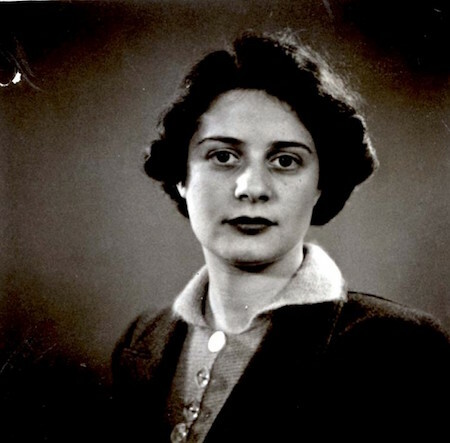 Her concept of herself as both German and Jewish remained unshaken. Perhaps she thought the Nazi era was an aberration and would eventually pass. Or perhaps she thought she was too old to run for her life in hopes of starting over in another place. You have to wonder, though, what she was thinking two months later when synagogues were burned and businesses looted in the nationwide pogrom called Kristallnacht. Actually, we know that Elly and Betty were somehow able to communicate through intermediaries more than once during the next 18 months while Elly and Helga lived as stateless Jews in Nice in the south of France. 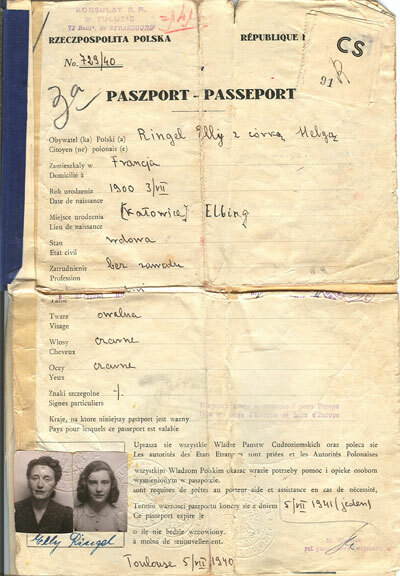 Against all odds, Betty was able to transfer a sum of money to Elly in May 1940, after Germany had conquered Paris. These were the funds that provided the means for Elly and Helga to escape from France to Portugal and eventually reach America. Remember that 1906 “certificate of belonging” that Hermann Ringel obtained from the city of Rzeszów. Before leaving Nice, Elly paid for a certified French translation of that document. A month later—after a frantic rush to Lyon, then Marseilles, then Bordeaux—she presented the documents at a Polish consulate in Toulouse. The document proved that her late husband “belonged to” the city of Rzeszów, and on that basis she qualified to receive a Polish passport. Betty Wohlgemuth lived three and a half years longer after saying goodbye to her daughter and granddaughter in Berlin. In October 1941, the cycle of persecution neared its conclusion as the deportations of Jews from Berlin began. Through January 1942, ten transports of roughly 1000 people each were sent to camps in the East. As a elderly widow, Betty was not listed to be taken on the early transports but the outcome must have seemed inevitable. 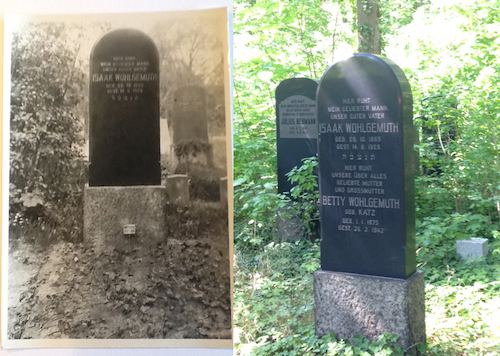 We didn’t know for sure what happened to Betty until fairly recently when Joanne uncovered the Wohlgemuth grave plot hidden in the brush at Weißensee Cemetery. Despite the ongoing deportation of Jews from Berlin at the time, this important Jewish institution in the borough of Pankow surprisingly remained in business throughout 1941 and 1942 and to a lesser extent after that. It is said that the Nazis let Weißensee operate in those years as a public relations stunt, something like their supposedly model concentration camp at Theresienstadt. Weißensee also served an definite need, as more than 1000 burials were made there in 1942. The surviving cemetery records show suicide as the cause of death on a surprisingly high percentage of those deaths. From the Wohlgemuth gravestone that Joanne recently visited, we now know that Betty was laid to rest next to her husband Isaac at Weißensee on February 26, 1942. We have not yet discovered the original cemetery record for the burial, so we don’t know if she died of natural causes or possibly—sad to contemplate—took her own life in the face of an expected deportation. She was buried at Weißensee by the still functioning Berlin Jewish community, which also took charge of any assets she had remaining. We don’t know if her name and dates were added to the headstone at that time or, according to Jewish custom, a year later. We also don’t know what her daughter Elly or even our mother Helga knew for sure about Betty’s end. Growing up, we three children had the general sense that Betty was a concentration camp victim. We have no information that she was ever in contact with Elly again after sending the money to Nice, even though Elly and Helga finally reached America about nine months before Betty’s death. Elly returned to Germany many times from the 1950s through the 1970s, though more ofter to enjoy Alpine resorts than to return to the city of her married years. I don’t know for sure that she ever went back to Berlin, but if she did and wanted to visit her husband’s and parents’ graves, she would have needed special permission to cross into the Eastern Zone in order to visit Weißensee. My mother, who always resisted going back to Germany, finally did in the 1980s. That was still a few years before the fall of the wall, and I believe she probably did not go to the cemetery, so it is possible that she and my grandmother never knew that Betty was thankfully buried alongside her husband. Not all the family members mentioned here were as lucky as Betty. 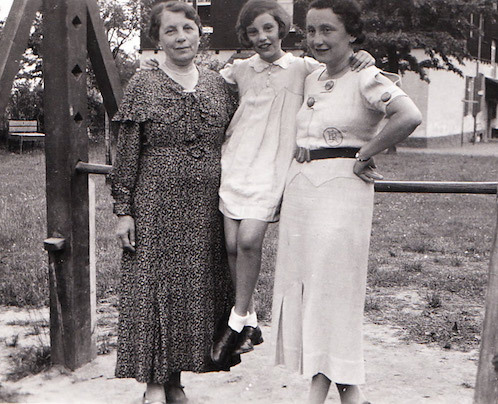 Hermann’s sister Rosa and her lovely daughter Margot were among the Jewish women and children of Belgrade who in early 1942 were rounded up and confined at Semlin concentration camp, then gassed to death in mobile vans. Fortunately, Roza’s boy Wolfie escaped that fate. Under his new name, Ze’ev Sharon, he worked with his pioneer group on the docks in Haifa, helped to found an important Israeli kibbutz, and passed on his Ringel genealogy to a large and growing family in the Jewish homeland. He passed away in 2009 at age 92. In one way, the Wohlgemuth gravestone (and also a Ringel one that we have not yet tracked down) represent the end of the story for Helga’s German family, and for the culture and ideals they represented. Yet when we return to Berlin in 2016 we find Helga’s childhood apartment building beautifully restored. We find Hermann’s orthodox synagogue still holding services a few blocks away. Of course, there’s the cemetery in Weißensee, where not only the Wohlgemuths but also Hermann Ringel is laid to rest. The rebirth of Jewish life in Berlin is fed in part by Jewish repatriates from the U.S. and Israel, as well as by far greater numbers from former Soviet republics. Today’s German culture is more eclectic, vibrant, and contradictory than the world that our forebears inhabited. However, among all that modernity, it is satisfying to know that currents of cultural history represented by German-Jewish families like the Wohlgemuths and Ringels are still a part of the mix.